Twenty-year-old Jane Austen is a young lady ahead of her time. Her wit and charm make her stand out among her contemporaries, and she dares to dream of the unthinkable; she is determined to marry for love. 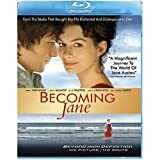 Unfortunately, her parents want her to make a conventionally advantageous marriage based on wealth and social position, and their choice of groom, a young man with aristocratic connections, does not please Jane. Soon, Jane meets the infuriating Mr. Lefoy, a young Irishman who can match wits with her. At first, the young gentleman's arrogance infuriates Jane, but as time passes, she finds herself tumbling into love with him. Sadly, Mr. Lefoy lacks wealth or aristocratic connections, so the two young people must choose between love and social acceptance.